This is the ‘makeweight’ title in the BFI’s double package of Blu-ray/DVD versions of An Autumn Afternoon, the last film by Ozu Yasujiro in 1962. Jonathan Rosenbaum’s essay included in the package makes clear that A Hen in the Wind has been neglected by many critics and considered one of Ozu’s minor works. Ozu himself is reported as describing it as a ‘bad failure’. It is certainly different from the later films and very different in some respects to its immediate successor, the highly celebrated Late Spring (1949). I personally find it a very moving film and it falls into my favourite period in cinema history in the late 1940s. I’ve just been back to look at what I wrote about Record of a Tenement Gentleman, the first film Ozu made when he returned to work in 1947 after re-patriation. My viewing of A Hen in the Wind confirms everything I wrote about the earlier film, but there are differences as well. The similarities to Italian neo-realism are again evident and the film seems in tune with what is happening in film internationally in those difficult post-war years. One noticeable feature of A Hen in the Wind is the presence of the great Tanaka Kinuyo in the lead role. Arguably the dominant female figure in classical Japanese cinema, Tanaka is one of our heroes. Although she was best known in her later career as an actress for Mizoguchi and as a director in her own right, she did make several films for Ozu (including some in the 1930s) and it’s hard to imagine any other star in this role as the central character Tokiko – even though she played the role of a 28 year-old when she was already 38. Tokiko is effectively a single mother with a small son. Her husband has not yet returned from the war. We are never told where the husband has been stationed – perhaps in China? Re-patriation did take a long time so in itself this is not unusual. Tokiko is a dressmaker by trade but she has to stay home with the boy and can only survive by gradually selling off her kimonos to raise money for food. When the boy falls ill and needs hospital treatment she has no other resources and she turns to the only solution – selling herself for one night only to pay the medical bill. Her close friend Akiko, is furious with her (for not asking her for the money) and criticises her quite severely. She advises Tokiko to tell no-one and especially her husband about what she has done. At this point we think we know what will happen when the husband returns – which he does soon after. We dread being proved correct. 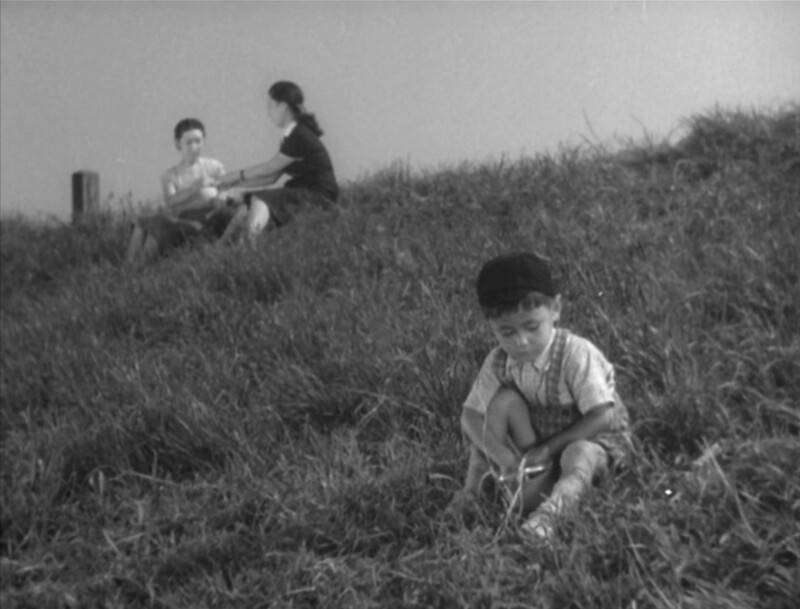 Tokiko and Akiko discuss their dreams as young women before the war while the boy, Hiroshi, now recovered from his illness plays in the foreground. A Hen in the Wind is deemed an anomaly – in both style and content. My reference to neo-realism refers to two separate issues. First of all Ozu and Shochiku were faced with logistical problems in making films at this point. A Hen in the Wind is short, 82 minutes and it avoids expensive sets or complicated location shooting. This supplies the production context (in effect the restraints) which ‘fit’ for a narrative focused on a single everyday event/social issue at a time of austerity. In plot terms the event is the sudden onset of sickness for Tokiko’s son. It is the need to find the money to pay for his treatment that creates the narrative drive (just as the theft of the bicycle propels Bicycle Thieves forward). In a sense, the same scenario could have been played out in Italy or Germany in 1948. The difference might be in the treatment of the shame attached to the act of prostitution. There is also a second social issue compounding the conflict created by the sickness – the slow repatriation of service personnel (and in the background the problems associated with the Occupation, not mentioned directly in the script). 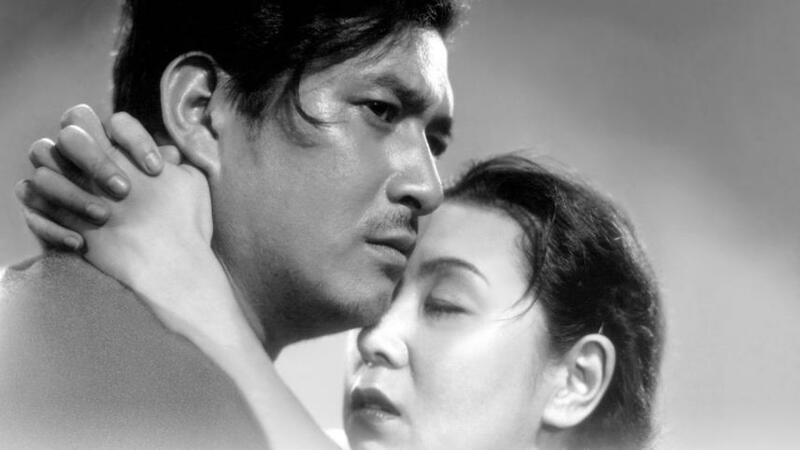 The same issues – health problems and re-patriation – are found in films by Kurosawa and Naruse during this period. What is also important is how Ozu shows us this world of austerity trying to ‘get back on its feet’. I was struck by two long tracking shots showing first Tokiko and then her husband moving through the streets of Tokyo. The evidence of bombing is still there and the urban scene can seem desolate with rubble and wrecked machinery by the side of the road. 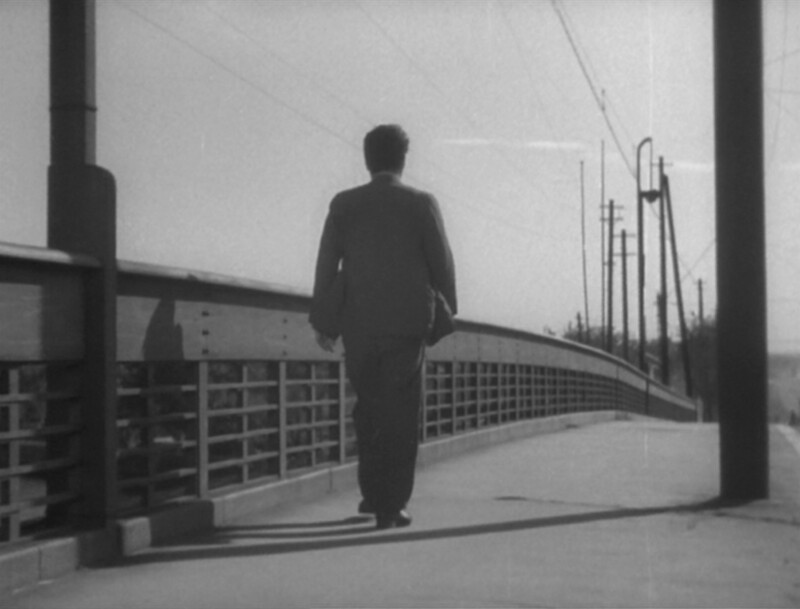 A moving camera in later Ozu films is so unusual that these shots are quite noticeable. They are also contrasted with more composed scenes set by the riverside. Both Rosenbaum and David Bordwell (Ozu and the Poetics of Cinema, BFI 1988) refer to the locations as ‘slum’ areas. I think perhaps ‘slum’ means something different in the US. Tokiko’s home is the top floor of a small wooden house rented from the family who live below. Nobody has much money but the connotations of slum housing – families crushed together in unhygenic mass dwellings etc. doesn’t apply. In fact I felt that somewhere in the film there was an attempt to present this as a transitional period when Japan is recovering. The scenes by the river seem more optimistic. Sound in the film is also important. Several scenes in the house are accompanied by what sounds like the thud of a machine in a factory. This contrasts with the sound of children singing in a primary school close to the brothel where Tokiko received her ‘visitor’. The singing is heard when Suichi, the returned husband, goes to the brothel and meets the young woman who works there in order to feed her family. This whole sequence offers the possibility of ‘moving on’ in some way. Music also provides one of the (surprisingly few) references to American culture in the dancehall/nightclub next to the office where Suichi eventually gets work. The other notable element in the mise en scène of A Hen in the Wind is the ‘pre-figuring’ of action focused on the staircase leading up to Tokiko’s apartment. Staircases are rarely shown in Ozu’s later films but here the staircase is introduced, almost like a pillow shot, early on. Later it will become the site of something even more unusual in Ozu’s later films – a sequence involving violent action. It is this violent action that will perhaps signal the biggest ‘difference’ to the films of Ozu’s late period and the way the staircase is used makes us think of Hitchcock thrillers or film noir melodramas. David Bordwell’s chapter on the film refers to Sato Tadao’s 1982 Currents in Japanese Cinema. Sato suggests that the film is essentially progressive in moving away from using easy scapegoats to represent the state of Japan in the aftermath of war. Instead of villainous militarists or weedy collaborators, Ozu offers us a woman whose shame reflects the loss of ‘purity’ in the Japanese spirit while Shoichi’s aggression comes from the brutalisin experience of war. In Ozu’s vision (as perceived by Bordwell) these ‘ordinary’ and flawed people find a way to face the future without national or personal purity but with a sense of realism – Ozu the humanist? Overall I found this a fascinating film which deserves to be more widely seen and discussed in the context of the ‘Occupation Cinema’ in Japan. Keith’s review of the film from the Tanaka Kinuyo season a few years ago at the Leeds International Film Festival takes a slightly different approach. He focuses more on Tanaka’s performance (and gives away more of the plot details). 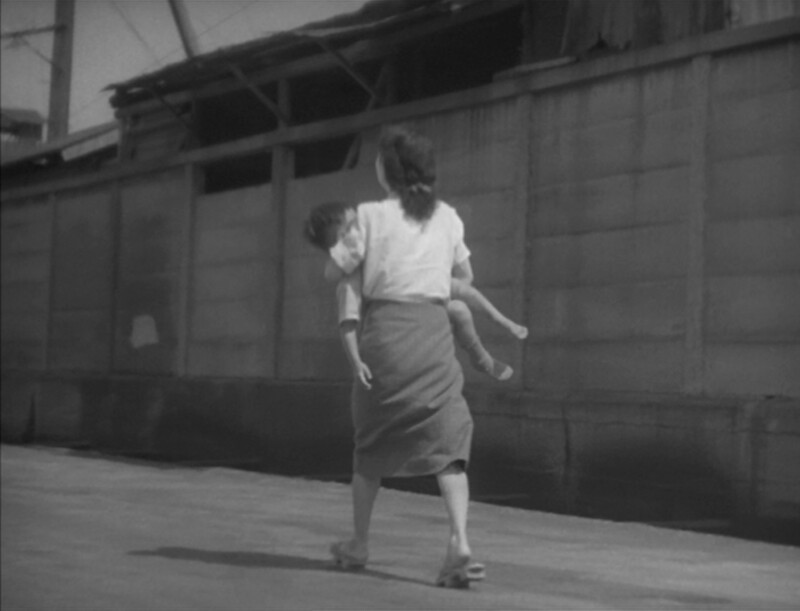 This entry was posted in Japanese Cinema, Melodrama and tagged neo-realism, Ozu, Tanaka Kinuyo. Bookmark the permalink.